One of the biggest problems with powerful smartwatches is battery life. Who wants to charge their watch every night? But what if your watch was made of modular blocks and you could add as many batteries as you like? That's the idea behind Blocks, a new smartwatch coming to Kickstarter before too much longer. Except you aren't just limited to adding batteries: there'll also be modules for GPS, contactless payments, a microphone, a SIM card for calls, and a heart-rate monitor. Each module will have swappable faces, too, so you can switch out colors and textures to totally personalize your wearable. The team behind the project expects that the core module with the screen will cost $150, and then $20-$40 for each additional module, for a total of around $330 if you want the complete set. If not, you'll get enough dummy blocks with the starter kit to put it on your wrist. There are even little half-blocks you can use to get a better fit. Curious about that battery life? They're estimating about a day's worth to start, and a half-day for each additional 100mAh module. 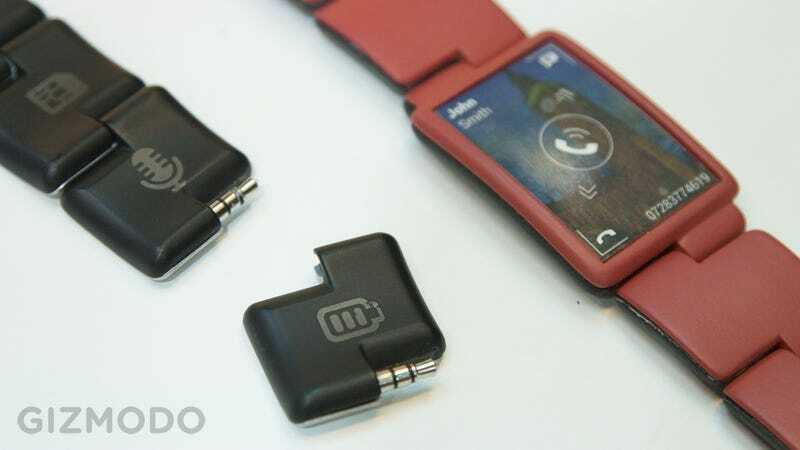 If this all sounds vaguely familiar, it might be because the Phonebloks team behind the watch is associated with a modular smartphone whose name you might have heard: the Project Ara phone was originally prototyped by Phonebloks before it went to Motorola and then Google. But both ideas still have a loooong ways to go. Google's holding a Project Ara developer conference next week to show off their latest prototype, and you can see the super chunky, barely-there version of the Blocks watch below. I think I'll wait and see if they can pull it off before I throw some money down.